Pelagosa is a small archipelago in the Adriatic Sea, situated between the Italian peninsula and the Dalmatian coast. The archipelago is composed of two islands: Great Pelagosa (Pelagosa Grande) and Little Pelagosa (Pelagosa Piccola). Additionally there are a dozen other minor islets and rocks, including Caiola, Sasso di Tramontana and Sasso d'Ostro. The geological structure of the archipelago is such that it forms a natural continuation of the Tremiti Islands (Isole Tremiti) and the Gargano Peninsula, and therefore is regarded as belonging geographically to Italy, rather than to Croatia. The islands are also closer to Italy than to the Croatian mainland, being only 53 km (33 mi) away from the Gargano Peninsula, and more than twice that distance away from Croatia. Archeological evidence suggests that the islands of Pelagosa were inhabited in prehistoric times, but nothing else is known of its prehistory. Based on archeological findings it is believed that the paleolithic inhabitants were the same as those inhabiting the rest of ancient Italy. According to legend, Diomedes – a veteran of the Trojan War – is said to have landed on Pelagosa and to have been buried there. Ancient Greek pottery has been discovered on Pelagosa, however no tomb belonging to Diomedes has ever been found and the legend is considered unhistorical. The official history of Pelagosa begins with the Romans, who colonized the islands and built a temple. The islands belonged to Rome for several centuries and was home to an early Latin Christian community. However, the islands were uninhabited during the Middle Ages. At an unknown date Pelagosa became part of the Republic of Venice, but the islands did not maintain any permanent population. Pelagosa was visited by Pope Alexander III on Ash Wednesday, March 9, 1177. In the 13th century a Lusignan noble, exiled from Venice, occupied the island of Great Pelagosa. He and a band of pirates transformed the island into an armed fortress, from which they engaged in acts of piracy and terrorized local fishermen until being defeated by the Venetians. Pelagosa then belonged to the Kingdom of the Two Sicilies. In 1843 it was repopulated for the first time since the Roman period, and was settled by fishermen from the island of Ischia near Naples. However, by the end of the 19th century the population had migrated back to the Italian mainland. In 1861 the islands of Pelagosa became part of the Kingdom of Italy. In 1873 the Austro-Hungarian Empire began to militarily occupy Pelagosa, thereby violating Italian sovereignty, but without protest from the Italian government. 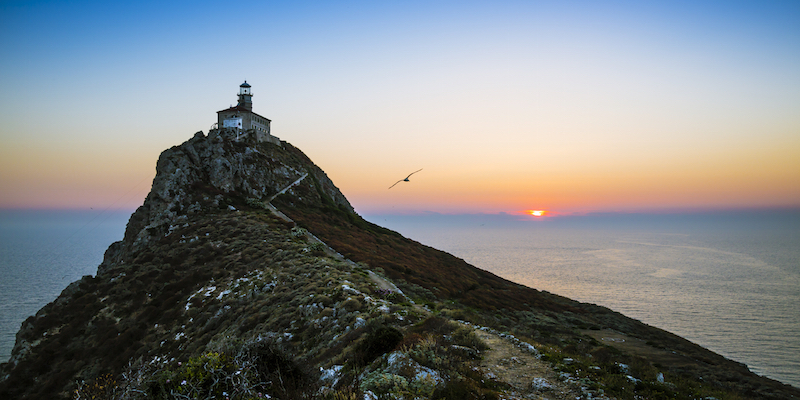 In 1875, during the occupation, a lighthouse was erected which still stands today. The question of Pelagosa, and its illegal occupation by Austria, was raised in an Italian parliamentary debate in 1891 but was ignored by the government. 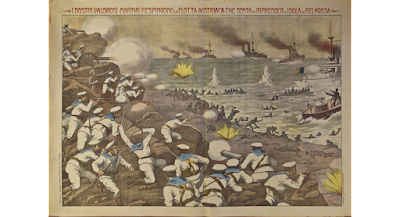 Pelagosa was finally recaptured by Italy on July 11, 1915 during the First World War. 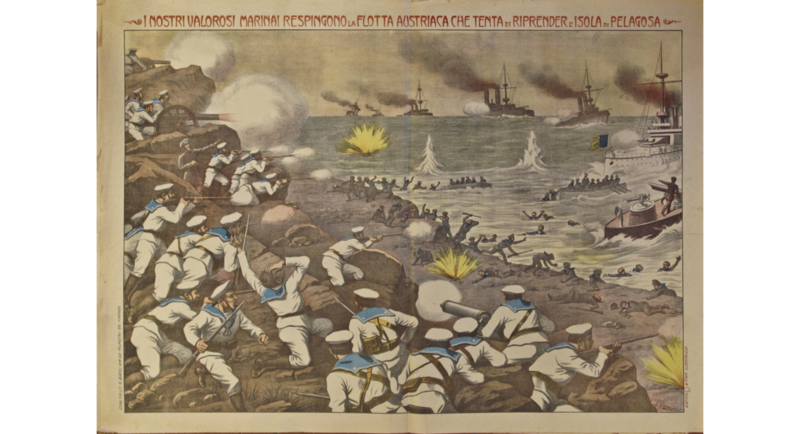 The Italian military held and defended the island for the full duration of the war. On August 5, 1915 the Italian submarine Nereide was sunk by the Austrians near Pelagosa, killing all crew members. The captain, Lieutenant-Commander Carlo del Greco, was later awarded the Gold Medal of Military Valour. In 1920, after the end of the war, Pelagosa was reincorporated into Italy, officially ending the Austro-Hungarian occupation. In the 1920's Pelagosa was settled by Italian fishermen from the nearby Tremiti Islands. A meteorological observatory, the church of San Michele, and two other buildings were constructed during this period. The islands initially formed part of the Italian province of Zara, but in 1941 were incorporated into the Italian province of Spalato. In 1947, after the end of the Second World War, Pelagosa was ceded to Communist Yugoslavia, together with the whole of Dalmatia, merely because it administratively formed part of the Italian provinces of Dalmatia. Thus it was that an entirely Italian archipelago, inhabited exclusively by Italians, located just off the Italian peninsula, and belonging to Italy for over 2,000 years, was arbitrarily torn from Italy and given to Yugoslavia – renamed “Palagruža” and artificially annexed to a Slavic state for the first time in history, despite never having any connection whatsoever to the Slavs, neither ethnically, nor politically, nor geographically, nor historically. In 1991, after the breakup of Yugoslavia, the islands of Pelagosa were occupied by the newly-independent country of Croatia. Today the islands are once again uninhibited, except by temporary visitors, and remains part of the Republic of Croatia.